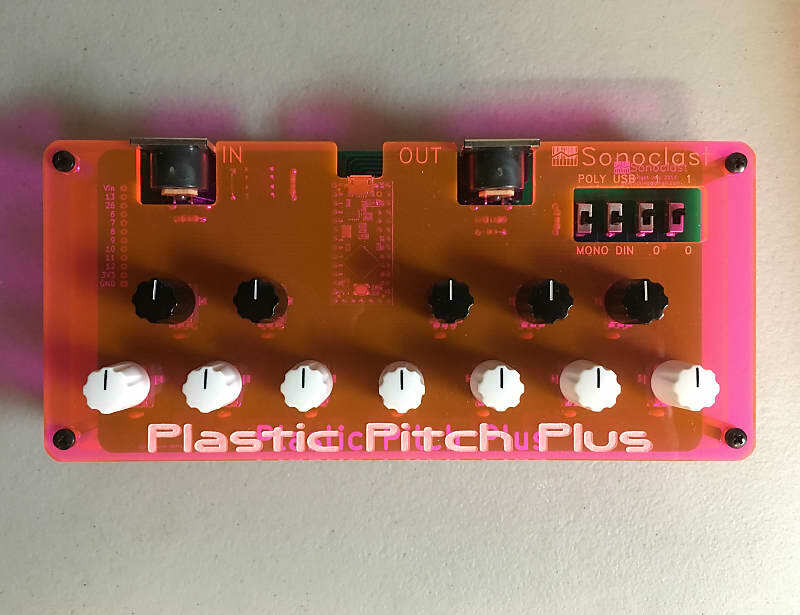 The Plastic Pitch Plus is a device for experimenting with microtonality. 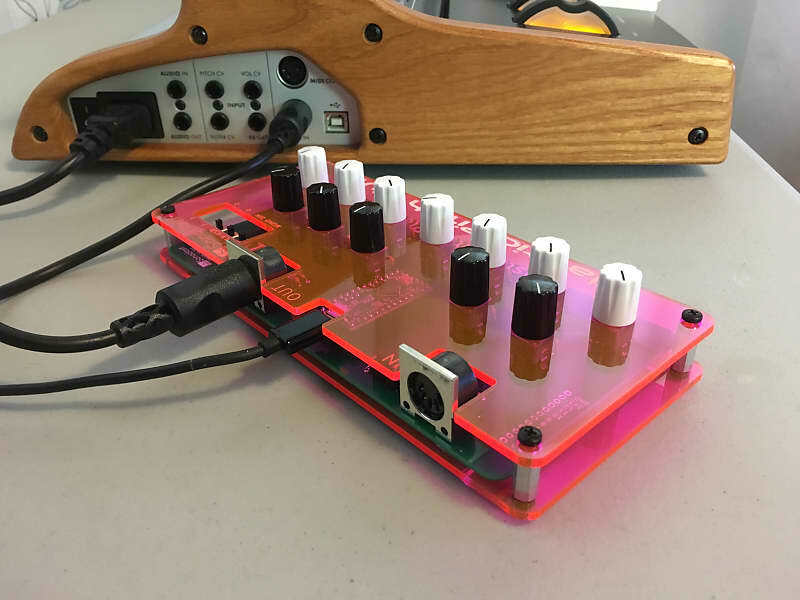 It uses MIDI to map keys to microtonal pitches. My primary design goal was to create a physical interface that gives immediate and independent control of pitches in a scale. One way of doing microtonality involves generating lists of frequencies or ratios. In contrast, I wanted something that would naturally engage my ear and provide an intuitive way to experiment with pitches. Two basic scale modes are available: 1) a twelve-tone scale mode in which the twelve knobs are used to tune up or down each of the twelve notes in a scale; and 2) an equal divisions per octave mode in which the keys of a MIDI keyboard are remapped to an integer number of equal divisions per octave between 5 and 53. The two basic scale modes are implemented in two ways: 1) using MIDI pitch bend; and 2) using the MIDI Tuning Standard. The MIDI pitch bend way is backwards compatible and designed to work with all MIDI synthesizers. Whereas the MIDI Tuning Standard is the future of doing microtonality with MIDI but currently only supported by half a dozen newer hardware synthesizers. MIDI input is via the IN DIN connector. MIDI output is user selectable between the OUT DIN connector and the micro-USB port for use with a computer. Power is supplied via the micro-USB port. When using the MIDI pitch bend way (as opposed to the MIDI Tuning Standard) a polyphonic synthesizer must also be multitimbral in order to play polyphonically using the selected microtonal scale. This is because multiple MIDI channels are required to have multiple pitch bend values being used at the same time. A polyphonic synthesizer that is not multitimbral can still be played monophonically per the PPP tuning. When using MIDI pitch bend (as opposed to the MIDI Tuning Standard) monophonic mode might result in unexpected tunings when holding down multiple keys and playing with a “last-note priority” technique. This is because there is no standard way for synthesizers to handle last-note priority in conjunction with the combination of multiple MIDI note and pitch bend messages. (Depending on one’s musical goals, this might be a feature.) The workaround is to play only one key at a time. I have found that some software synths--specifically Propellerhead Reason ones--have noticeable latency in their MIDI pitch bend implementation. This results in swooping pitch at the attack when playing thru the Plastic Pitch Plus. Other software synths work correctly.